The sixteenth century in Northern Europe and Iberia saw serious religious upheavals and great economic shifts. Within the art world itself, refinement in the use of oil paints and the re-emergence of Classical motifs further energized artists and patrons. During the sixteenth century, political, social, and religious turmoil often manifested itself in works of art. To engage students at the beginning of your class, take a close, analytical look at the Isenheim Altarpiece by Nikolaus Haguenau and Matthais Grünewald. The altarpiece was completed over ten to twenty years, beginning with the sculpted portion by Haguenau in the early sixteenth century. The paintings by Grünewald reveal a great deal about the socio-religious climate and its impact on personal devotion across the region at the dawn of the sixteenth century. The grotesque appearance of Christ and the idea of dismemberment appealed to the invalids convalescing at the abbey Hospital of St. Anthony in Isenheim, who would have been exposed to the various images of the altarpiece throughout the liturgical year. Further, Haguenau’s sculpted figures flanking St. Anthony—Sts. Augustine and Jerome—became increasingly important during the Reformation and Counter-Reformation, because the doctrines they established served to reaffirm the stance of the Roman Catholic Church against the charges of Protestant reformers. The Musée Unterlinden has a wonderful virtual “tour” of the altarpiece that demonstrates how each panel opens. Ask students to explore the symptoms and treatments of ergot and the plague and the ways both are transliterated onto the panels. Why would Grünewald paint such a gruesome image of Christ? How does Grünewald recreate amputation within the altarpiece? How would viewers interact with this altarpiece? El Greco (Doménikos Theotokópolous), The Burial of Count Orgaz, c. 1586. Print resources might include standard survey textbooks, like Gardner’s Art History Through the Ages: A Global History, Stokstad’s Art History, and Janson’s History of Art: The Western Tradition. Oxford Art Online (available institutionally) provides excellent general information about topics like individual artists, specific art movements and techniques, and much more. Sections of the Metropolitan Museum of Art’s The Art of Renaissance Europe: A Resource for Educators and sections of The Inquiring Eye: European Renaissance Art, produced by the National Gallery of Art in Washington, DC also offer good information on artists, themes, and historic background. Smarthistory also has some wonderful resources on the Reformation, Dürer, El Greco, the Isenheim Altarpiece, and much more. Fordham University has compiled a wonderful list of primary sources on the Reformation and Counter-Reformation as part of their Internet History Sourcebooks Project as well. From the initial discussion and analysis of Grünewald and Haguenau’s altarpiece, you may want to further discuss the ways in which art and architecture “speak” about the cultural and social milieu of any given time and place. The art and architecture of the sixteenth century in Northern Europe and Iberia provide excellent examples. The people of different regions upheld and revered varying mores and ideologies. What ideologies and practices are depicted? How are these expressed in art and architecture? The discussion of the Isenheim Altarpiece further engenders an awareness of the “voices” works of art and architecture possess. After the initial discussion and analysis, continue to present, analyze, and discuss the historical events of the sixteenth century and the accompanying works of art and architecture. Although Grünewald and Haguenau’s altarpiece depicts a more canonical religious scene, Hieronymous Bosch’s Garden of Earthly Delights remains unique and contrasts sharply with the coeval artwork from the Italian peninsula in that it lacks a direct Biblical, apocryphal, or hagiographical narrative. This triptych depicts a more austere view of life and death. The left panel illustrates the Garden of Eden. The center panel presents the viewer with fantastic physical pleasures of the corporeal realm. The right panel, in particular, reveals a vivid rendition of Hell. These images reflect the anti-worldly views expressed in religious writings of the late fifteenth century, like the Imitation of Christ by Thomas à Kempis. Despite its overt religious imagery, a private patron commissioned the painting, so the painting may have been meant as a conversation piece. Netherlandish paintings of this kind often brought about this type of interaction from their viewers. Discussion of salvation and the human condition was a popular if controversial topic throughout the sixteenth century in Northern Europe. The Reformation, led by reformers like Martin Luther, forcefully impacted the religious, political, and artistic community of the region. Luther vehemently questioned and sometimes condemned the practices of the Roman Catholic Church, most famously when he posted his 95 Theses to the cathedral door at Worms in 1517. Luther and other Protestants demanded changes in the hierarchical leadership structure of the Catholic Church and rejected priestly mediation, among other things. With the Protestant condemnation of certain religious practices and traditions like the luxurious decoration of churches, religious painting changed dramatically. Albrecht Dürer’s painting The Four Apostles illustrates the Protestant opposition to the pope, as well as a rethinking of the place of art in religious settings. Dürer had experienced a personal shift in his religious conviction, and this painting elucidates the change. The painting’s original location also indicates a great deal about the contemporary religio-political climate in that it was hung in the city hall of Nuremburg rather than within a church. You might ask your students: how does the setting within a civic building differ from the location of a work of art like the Isenheim Altarpiece within a religious one? Does it change the way the viewer interacts with and perceives the work of art? Dürer’s earlier religious paintings did not display overtly Protestant ideologies. His engraving of Adam and Eve from 1504, for example, shows his interest in and studies of Classical Roman sculpture. The revival of Classical motifs and themes so popular in the Italian peninsula pervaded Dürer’s oeuvre, too; the contrapposto stance of both figures indicates this attention and interest. The Eve figure’s pose could be likened to that of the Knidian Aphrodite, meaning that Adam and Eve, like many other Western works of art created around this time period, married Classical, pagan devices with Christian narratives. The print also visually confronted the contemporary understanding of the four “humors” or elements—phlegm, blood, yellow bile, and black bile—and the belief that they constantly altered within humans due to sin. Poor health was often ascribed to divine punishment during antiquity. These beliefs were adapted by Christian adherents in the Middle Ages and persevered into the sixteenth century. Prior health practitioners, including Hippocrates, Aristotle, and the second-century Greek physician Galen, studied the four elements and observed how they affected humans. These philosophers maintained that the four humors required careful balance in order to ensure good physical and mental health. The humors are symbolized in the engraving by the animals illustrated around Adam and Eve: phlegm is symbolized by the ox, blood is symbolized by the rabbit, yellow bile is symbolized by the cat, and black bile is symbolized by the elk. Continuing a fifteenth-century trend, the artist-patron relationship developed and transformed in the sixteenth century, as did the view of the artist as more than a mere craftsperson. During the Middle Ages, many artists were considered artisans or craftspeople, affording them a very humble status. Their livelihood was almost entirely dependent on the generosity and needs of patrons or buyers. The skill level possessed by individual artists greatly impacted their prestige later on. The careful observations of artists like Brunelleschi, Leonardo, and others, catapulted visual artists into the realm of scientists, mathematicians, and the like. Patrons thus sought out certain artists, and those artists could gain better levels of financial stability and artistic agency. Dürer was recognized around Europe and attained a certain level of celebrity not unlike that of Michelangelo in Italy. He is often noted as the only non-Italian artist to garner such fame and notoriety during the sixteenth century. Ask your students: where might we see the shift in the view of the artist as creative genius rather than craftsperson? Dürer’s Self-Portrait reveals a great deal about his level of craftsmanship as well as how he “crafted” his self-image. Dürer portrays himself handsomely, clothed in luxurious fabrics, and with great attention to details like textures and light. His virtuosity is displayed in the fur-like texture of the coat’s lining and the lifelike qualities of his long, curly strands of hair. The implied vertical line created between the figure’s face and hand keeps the attention of the viewer closely focused on the visage of the sitter. Having visited and studied in Italy, he became familiar with the idea of the artist as an independent, creative genius. He depicted himself in this way in the portrait—very idealized and, probably not coincidentally, with similarities to other images of Christ, such as in Leonardo’s Last Supper or Veronese’s Christ in the House of Levi. Indeed, portraits continued to serve as a sort of status symbol. Rulers and other important figures commissioned their portraits from highly regarded painters, a prominent example being Hans Holbein the Younger. Born in Augsburg, Germany, Holbein began his career in Switzerland with his father, Hans Holbein the Elder. He left Basel for good around 1532 after iconoclastic riots broke out. Holbein worked in England and eventually became the court painter in the court of the Tudor king Henry VIII. The courts of sixteenth-century Northern Europe often employed court painters, whose commissions would include mostly portraits of members of the royal family and other important dignitaries. Holbein’s painting of The French Ambassadors combines the practice of portrait painting with commentary on the religio-political situation at the time. A table holding a variety of objects separates the two figures: Jean de Dinteville, the French ambassador in England, and Georges de Selve, a diplomat and bishop. These objects represent religious turmoil and send a message of hope for peace and understanding between opposing religious factions. For one, Holbein included an open hymnbook displaying Martin Luther’s translation of Veni, Creator Spiritus. The lute with a broken string alludes metaphorically to the discord between the Protestant factions and the Roman Catholic Church. The painting also includes a distorted image of a skull, symbolizing mortality. These reminders of mortality (“memento mori”) softened the narcissistic qualities of portraits and reminded both the sitters and the viewers of the transient nature of fame and social status. If viewed from a certain angle, the distortion of the skull corrects itself. Distorted images like this were very popular and demonstrate contemporary interest in optical illusions and anamorphosis. In Italy, for example, Leonardo also famously studied such trickery-of-the-eye. The tension depicted in The French Ambassadors reveals the anxiety around the separation of the English from the influence and authority of the pope in Rome. Henry VIII, once a champion of Catholicism, grew increasingly irritated with the pope’s refusal to grant him a divorce from his first wife, Catherine of Aragon, eventually breaking from the Roman Catholic Church in 1536 to form the Anglican Church. In the aftermath, Holbein painted a portrait of Henry VIII in celebration of his fourth marriage to Anne of Cleves. Like Dürer’s self-portrait, Holbein displayed his figure in an idealized fashion, with a strong sense of authority and power. At the time the painting was completed, Henry VIII was in his late forties and suffered a number of ailments, none of which Holbein revealed in the painting. Instead, his figure fills the space with vitality, and his costume speaks to his illustrious political status and emerging religious significance. In the French court, Jean Clouet served as the royal painter to Francis I. Francis was a great patron of the arts, famously inviting Leonardo to his court, from whom he received the now famous Mona Lisa. Francis is also mentioned in first book of Castiglione’s Book of the Courtier, and he established an important center for the arts at the palace of Fontainebleau, where Benvenuto Cellini completed his famous salt cellar. He is remembered as a rather suave gentleman, an attribute which Clouet captured well in his portrait, Francis I; Francis appears handsomely and richly dressed, his hat jauntily askew on his head. The tone of the portrait is less severe than that of Holbein’s Henry VIII; Francis turns slightly to the right of the viewer, eschewing Henry’s dominant, frontal gaze. Ask your students: How do the self-portrait of Dürer, the two portraits by Holbein, and this one by Clouet compare and contrast? Sixteenth-century architecture in France also bore the influence of Italian trends. Francis I initially commissioned the refurbishment of the Château de Chambord, though he never saw the work completed. The château is modeled on an Italian palazzo, though many features, like the chimneys and lanterns bear typically Gothic silhouettes. Francis I’s successor Henry II oversaw the remodeling of the Louvre in Paris. The architect, Pierre Lescot, combined Classical motifs and Italian designs with typically Northern European features. Lescot employed Classicizing features like arcades and pilasters, but he reticulated the façade with uniquely French pavilions. In the Netherlands, some artists elevated members of the lower social strata into painted images. Pieter Bruegel the Elder’s series of paintings on the months of the year, including The Harvesters and Hunters in the Snow, mimicked “books of hours,” like that of the Limbourg Brothers (see the accompanying AHTR lecture on Northern Renaissance Art (1400–1600)). Books of hours served a devotional function, and many were heavily decorated. Since books of hours contained a calendrical quality, the illustrations therein corresponded with the time of year during which certain pages were read. A wealthy, Dutch merchant commissioned the series by Bruegel, and like Bosch’s Garden of Earthly Delights, the series probably served as a conversation starter. The images in the series, like Hunters in the Snow, were perceived as naturalistic—depicting the peasantry in their natural state—though they probably also contained some satirical content. Books of proverbs were also extremely popular in the region during the sixteenth century, and Bruegel’s painting Netherlandish Proverbs illustrated several. Erasmus and Rabelais recorded these proverbs and other similar stories. You may ask your students: how would viewers have interacted with this particular painting? Interestingly, the artwork of sixteenth-century Spain contrasts with these other works of art, largely because, at the time, Spain’s focus was on the New World, exploring the new territories in the Western Hemisphere, and upholding the values of Roman Catholicism. El Greco (Doménikos Theotokópoulos) emerged as an extremely important artist at this time due to his idiosyncratic religious imagery. He moved to Spain from Crete, after a brief sojourn in Italy, and his style blended traditional Byzantine religious painting with Italian Renaissance themes and characteristics to the satisfaction of his Spanish patrons. Like Dürer, El Greco studied in the Italian peninsula, and his Mannerist figures are representative of the influence of Italian painters like Tintoretto and Titian. Like Bosch, El Greco’s work deviated from the output of other sixteenth-century artists in revealing his inner philosophies and studies, particularly the religious writing of Dionysius. Dionysius’ philosophy of light had famously inspired Abbot Suger’s endeavors at the Cathedral of Saint-Denis in the twelfth century. 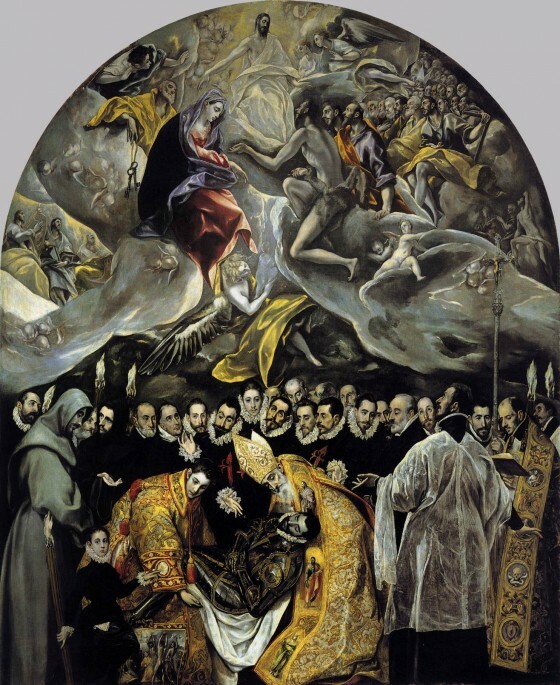 El Greco’s Burial of Count Orgaz illustrates the blending of the early influences of Byzantine art and the later influences of Mannerism on his oeuvre. Moreover, the painting combines a historical event with a celestial one, depicting the burial of Count Orgaz in the lower half of the composition with a celestial group above. Christ sits at the apex of a triangle created by the figures of the Virgin Mary and John the Baptist. Below them, El Greco created a tableau of the eponymous scene. El Greco’s Resurrection even more specifically illustrates his religious zeal. The elongated figures display the influence of Mannerism on El Greco’s repertoire, though subtle features like the halo recall more traditional Byzantine pictorial elements. His use of dramatically contrasting colors in the red and white fabrics flanking the Christ figure purposefully draw the attention of the viewer. The contorted poses of the figures below Christ foreshadow Baroque tendencies, and the foreshortened figure at the bottom of the canvas bears similarities to Caravaggio’s later Conversion of St. Paul (c. 1601). Explore and discuss the ways in which artists still express social conventions in works of art today. Ask your students if they know of works of art that indicate turmoil related to social, political, or religious events in the modern world. Examine how portraiture has changed (or has not changed) since the sixteenth century. Images of celebrities and political figures present excellent examples to compare/contrast techniques (pose, proportion, iconography) used by Northern Renaissance painters.